A helicopter of the Greek Navy crashed in the Aegean Sea early on Thursday morning, with two crew members found dead and the third missing. According to the Greek Navy, the helicopter disappeared from the Hellenic Air Force’s radar at 2:45 a.m. on Thursday as it was flying over Kinaros islet, near the island of Amorgos. A rescue mission went searching for the wreckage that was finally found on the islet of Kinaros. The bodies of the two passengers were found, but the third is still missing. The Agusta Bell 212 helicopter took off from Navy frigate “Nikiforos Fokas” as part of a military exercise called ASTRAPI (Lightning) in the region and was conducting a night flight very close to the surface of the sea. 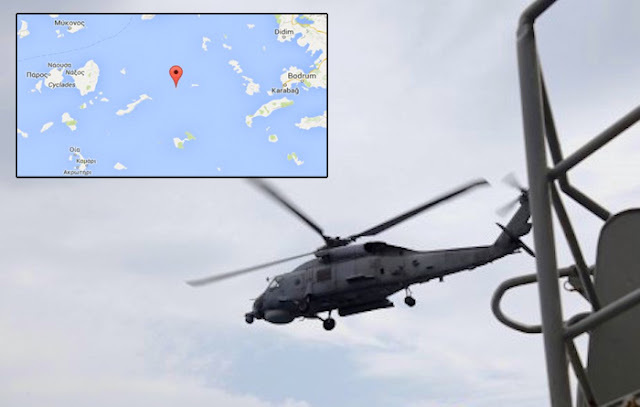 The last time the helicopter was spotted was at the islet of Kinaros located in the sea area between Greece’s Cyclades and Dodecanese island clusters, west of Kalymnos and Leros and east of Amorgos. The wreckage was found by another helicopter of the Hellenic Navy that was participating in the search.